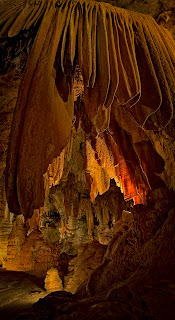 Image number two in the Luray Caverns series- Created from the slow flow of cave water over a period of time, the resulting thin, carbonate deposites descend from the cave wall in the form of great, majestic shawls. This HDRi vertorama was created from three sets of five exposures using a 2ev. spacing.